What Toys Should I Provide for Babies and Toddlers? Toy shop shelves are laden with toys claiming to be educational. For toddlers and babies, this usually means something noisy, requiring batteries. I have always held that there is little educational value in such toys. In my experience children play with them for a short period of time before moving on to something else. Alison Gopnik discusses the manner in which children experiment with toys in her book the Philosophical Baby. A toy that worked by moving levers was presented to a group of 4-year-olds. The adults demonstrated to the first group, how it worked, while the second group were left to work it out for themselves. The second group spent significantly more time playing with the toy than the first, who quickly abandoned it once they understood its function. Another recent study led by Professor Anna Sosa of Northern Arizona University focused on children between the ages of 10 and 16 months old. 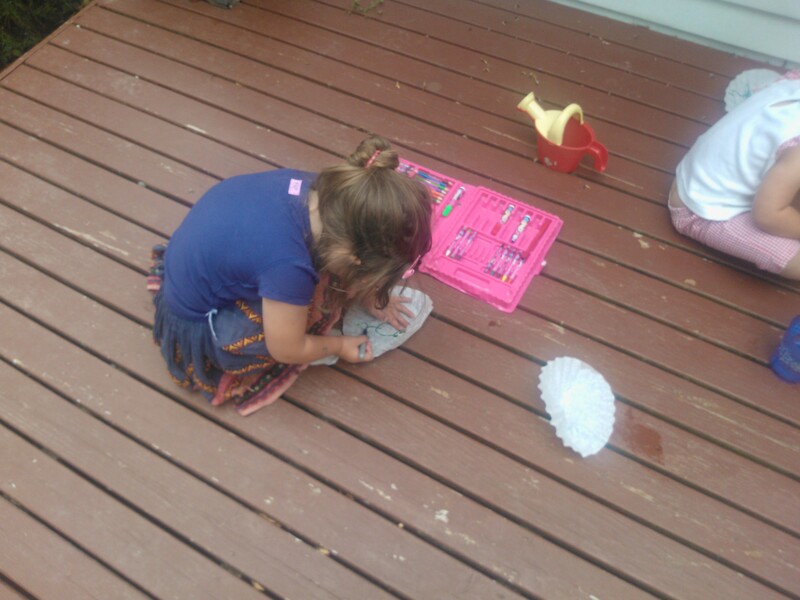 She gave families three different kinds of toys to play with; books, traditional toys like stacking blocks and electronic toys. The toys that stimulated most conversation were books, closely followed by blocks. The families playing with the electronic toy shared very little conversation, allowing the toy to do the talking for them. If you are considering which toys to buy for a young child, these points may help. The most important resource we can give to babies and toddlers is ourselves. Spend time playing tickling games, singing to them, playing rhyming games, blowing bubbles or rolling a ball. Other suitable toys for babies and early toddlers include small musical instruments for exploring sound ( saucepans, spoons and homemade shakers work equally well), a treasure basket or board and cloth books. Think about toys that they will play with for a long time. The best toy investments for our family include magnatiles, wooden blocks, paper and pencil, a magnetic drawing board and play food. Toys do not need to be expensive. 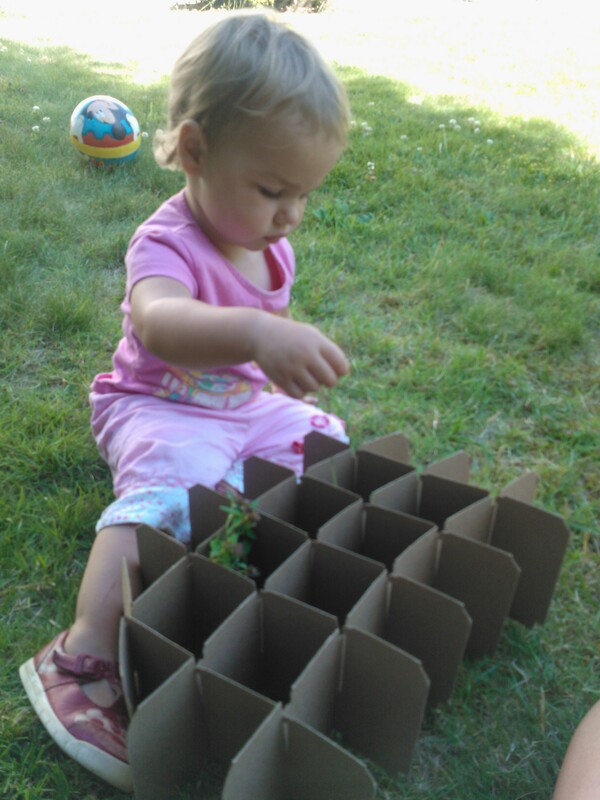 Children can have hours of fun with a balloon, pot of bubbles, home-made play dough or a cardboard box. The infographic below has many more developmentally appropriate ideas for play. We have been in the US for 6 weeks but our furniture and the majority of the childrens’ toys will not arrive for another month. During this period we have become experts at finding things to play with from around the house. We brought a small selection of basic toys – colouring pencils, scissors, a glue stick, paper, a ball and a few books, other than that we have made our own fun. The other children in the street think it is strange to come to a house with no toys but if I am honest I don’t think there is a great deal that the children have missed. I have been meaning to write a post about some of the household objects that we have played with for some time, but an article that I read yesterday made me look at it from a different perspective. Sadaf Shallwani’s article Questioning Play and Child-Centred Approaches discusses her experience of teaching children in Pakistan. Here, childrens’ learning was not built around pretend play but came from real experiences. Children would not learn to cook in a pretend kitchen but would be taught to use real kitchen utensils in a safe manner. She also questions Western notions of child-centred education. Early educators try to see the world through a child’s eyes and provide child-sized furniture and objects. The value of using real objects is recognised in many highly-acclaimed pre-schools. The schools of Reggio Emilia use many real-life scenarios as the basis for their projects and a colleague who visited the schools was surprised to find the children climbing onto adult-sized chairs and tables. A key philosophy of the Reggio Schools is the belief that children are capable. With this in mind the teachers help the children to use real tools and objects. Similarly in the Danish Forest Schools that another colleague visited, young children were taught to use real tools and knives to whittle sticks and were free to roam in the woodlands and on the beach and trusted to return at the sound of a whistle. I remember as a child using real objects from my kitchen to play shops and tea parties. Toy versions of everything are so readily available these days that it is easy to be drawn into the need to buy more and more. It is also easy to fall into the trap of believing that children need adapted versions of things for their own safety. 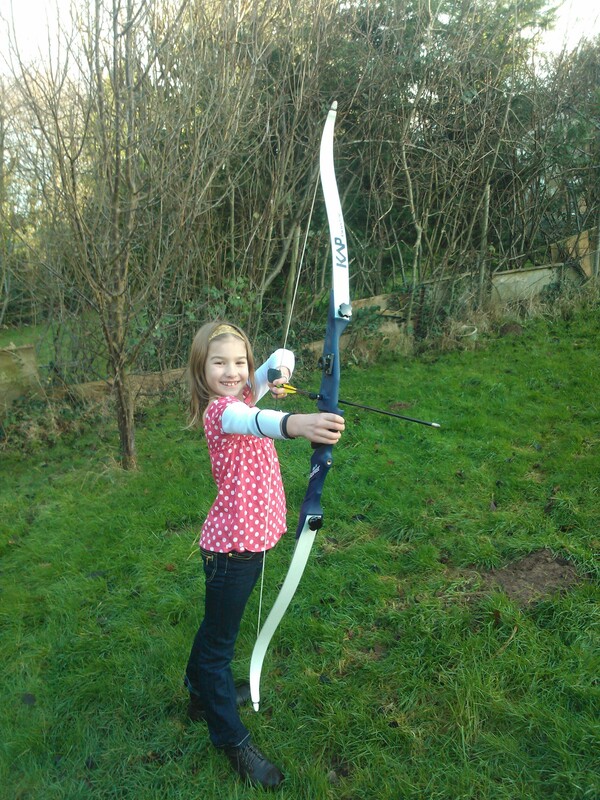 If we trust them with real things, spending time explaining the risks and demonstrating how to use them properly, children are more safety-conscious than those who do not understand the danger of the real objects. Not having toys has been a very useful exercise. We have used things from around the house and recycled boxes and paper to create an Olympics and a mud kitchen, we have borrowed books from the library and we have played ball games and skipping. 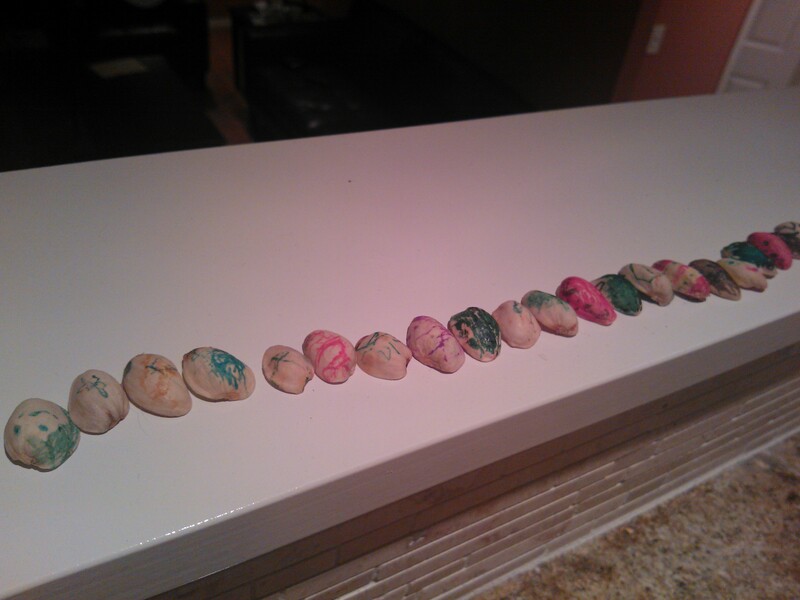 We saved the shells from our pistachio nuts and the girls had great fun decorating them. We coloured them so that we could make flowers and patterns and decorated some to look like ladybirds and other bugs. My 3-year-old chose some pebbles from the garden to decorate as they weren’t quite so fiddly for her small hands. 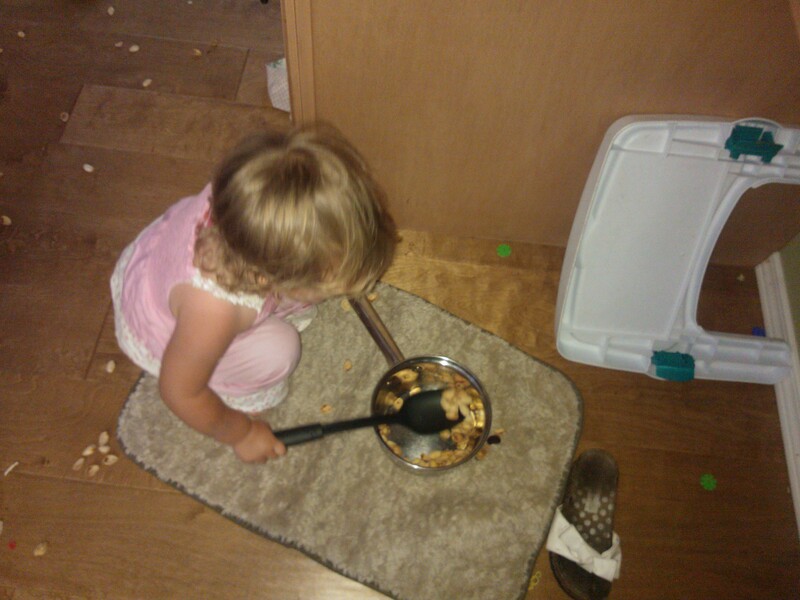 On another occasion I gave my 1-year-old the tub of shells along with a pan, spoon and a number of containers. She enjoyed scooping them and transporting the shells from one container to another. She also liked the sound they made as they fell onto the floor. As she walked they stuck to her feet so I showed her how to pick them up with her toes which she thought was very funny. I remember doing this activity in science lessons at school. 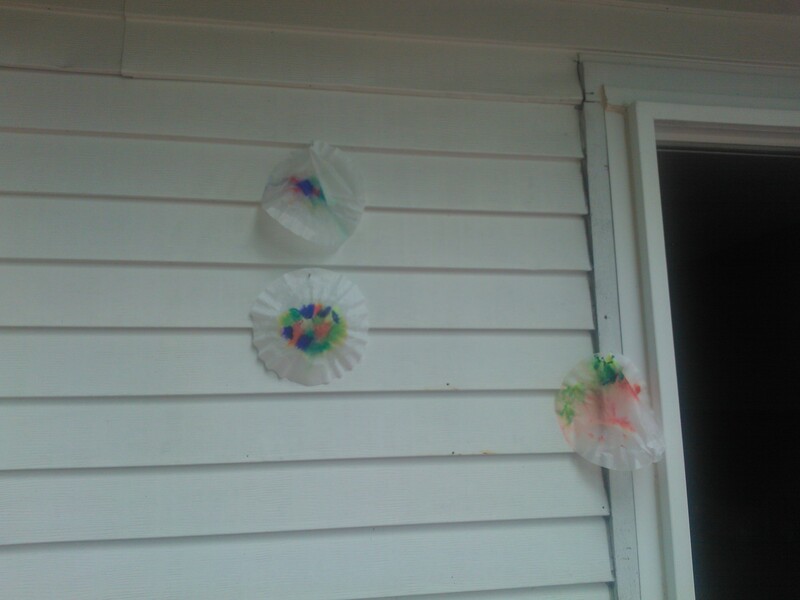 I gave the girls felt tip pens and coffee filters and asked them to draw patterns on them. When they had finished they were given a small pot of water and I showed them how to drip it on to the paper creating rainbow colours. We kept newspapers and magazines with a view to making papier-mache. The girls would like to enter a local parade on Saturday and I suggested they might be able to make papier-mache masks. My 3-year-old had other ideas. 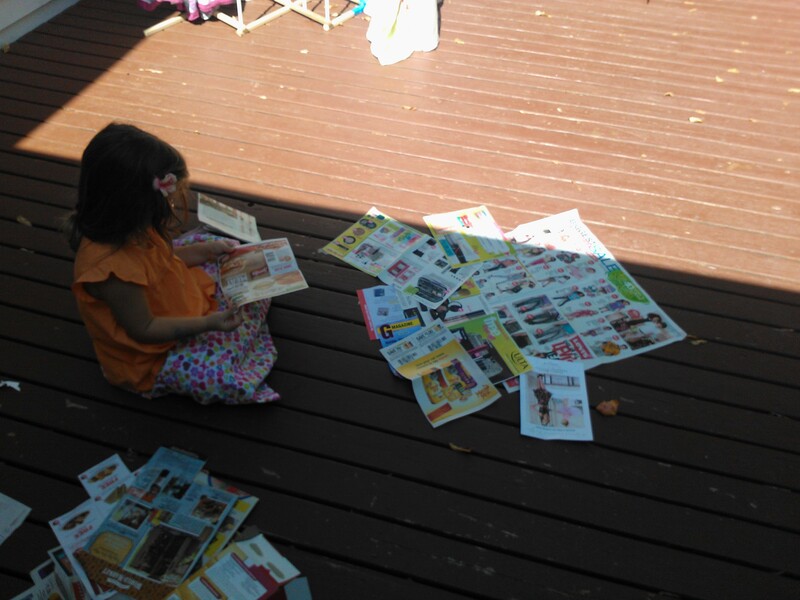 She decided to spread the paper across the floor. ‘I’m making a bed’ she said. I’ve often felt that my house has been taken over by toys that the children hardly ever play with, so I’m not particularly looking forward to them all arriving. I hope that being creative with household objects will help us all to think about what we could use instead of buying yet another toy and maybe I can keep most of the toys in their boxes when they arrive.